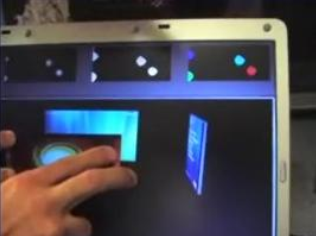 Recently I noted an interesting video at Channel 9: Inside MultiTouch: Team Demo, Lab Tour which shows an interview with members of the MultiTouch Research team at Microsoft Research in Cambridge UK. Microsoft is exploring the use of IR technology over the traditional approach of using capacitive touch panels. The iPhone, for example, uses a capacitive touch panel built into the display. The Microsoft Surface Computing technology uses a rear projection / sensing system that enables a high sensing resolution but is bulky and expensive. The Microsoft MultiTouch approach, however, uses a number of small infrared transceivers mounted on the rear of LCD panels to enable a more compact solution but at a lower resolution (but still sufficient for detecting multi finger touch). A prototype, developed at MSR Cambridge consists of an array of IR emitters and IR detectors arranged on a tile which is pressed against the back of the LCD display. IR light passes thru the LCD panel and is reflected back to the IR receivers after bouncing off objects such as fingers. The tile consists of an array of 5×7 emitters and receivers to provide effectively a 35 pixel camera element over an area covered by the size of the tile. Multiple tiles can be combined to cover the whole screen. The video shows how off-the-shelf LCD displays can be modified to provide the necessary proof of concept of this approach.